Yesterday I attended Puppet Camp London 2013 at Somerset House. It was an interesting day with a lot of good talks and demonstrations. In this article, I’ll attempt to link to all of the speakers and slides from the event and describe what I found interesting. The day was sponsored by Red Hat and Quru. The began with Dawn Foster, Community Manager at Puppet Labs, introducing Puppet Labs CEO Luke Kanies. The slides from the Luke’s talk can be found here: State of Puppet – London. Readers may also be interested in Chris Spence State Of Puppet slides featured on the Puppet Camp Barcelona Wrap Up blog post or the slides from the San Francisco Puppet Camp – State of Puppet – San Francisco 2013. All of the talks were interesting, but this is the one where I can start to reap immediate rewards. Firstly, it provided good ways of writing puppet modules, and there are definitely good take-aways from this such as writing puppet modules that perform very small, discrete pieces of work. Dependencies between puppet classes is also a bad idea. RSPEC Puppet, puppet parser and Puppet Lint are great tools for checking your code, although it was pointed out that puppet-lint can be very, very picky, so use with appropriate settings that work for you. You can find more about Scale Factory from their website, whilst the slides from Jon’s presentation can be found here – Building Reusable Puppet Modules. Jon’s Twitter profile is jtopper. The slides that Jonas presented can be found at Puppet Camp London 2013 Puppet And Razor Jonas Rosland. Razor is a provisioning system that can be used quickly provision new servers – both physical and virtual. The key thing is that it’s event driven rather than user driven. In the demo, Jonas configured Razor to provision certain types of servers depending on certain conditions. The example used physical RAM to determine what type of Operating System should be installed when a server is PXE booted, but you can use it on any kind of variables that you get from factor. I’m not sure how this would work in remote sites where you don’t have a PXE server. The install of Razor looks very straightforward. Jonas has some useful links on his pureVirtual website: Puppet and Razor. De-centralise and Conquer: Masterless Puppet in a dynamic environment: Sam Bashton – Bashton Ltd. The slides that Sam presented can be found at Decentralise And Conquer Masterless Puppet In A Dynamic Environment. This was a really interesting presentation. Essentially, Sam was building a set of RPM’s which can then be deployed to the target servers via Pulp. Puppet then runs locally on the remote target, triggered from a postinstall command in the RPM package. There’s no central puppetmaster in this setup, so no single point of failure. John presented ManageIQ. This clever piece of software interrogates your SAN arrays and discovers the Virtual Machines that are installed there. It can then look into these machines to determine what’s running, what files are installed, record changes on these files and perform full inventory control. It can even prevent a VM from being powered on if it violates a policy, such as not being an approved O/S. ManageIQ is being used by UBS and other big organisations. Red Hat acquired ManageIQ in December 2012, so expect to see this rolled into Red Hat products soon. Hopefully, much of it will become open source too. There was no slideshow from Chris, it was a hands-on demo showing how Hiera can simplify puppet code, how configuration files (such as a load balancer) can be dynamically generated as servers are powered up and powered down, and he showed some useful Puppet 3.0 commands. Chris has written some puppet modules which can be found on Puppet Forge and has some useful material on his blog. Overall, it was a good set of talks and great to talk other puppet users to discover how they are using it. I’ll certainly be using Hiera for deployments and I’m going to start using tests for my modules. 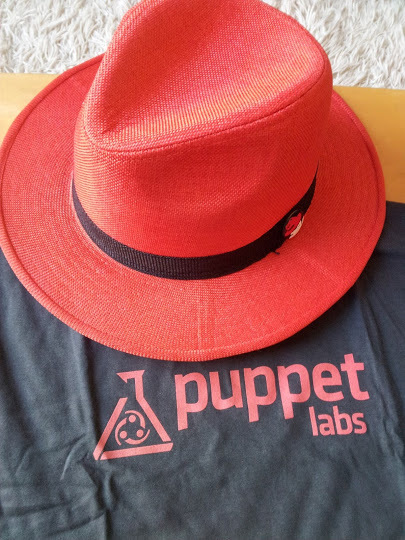 In terms of contact with the Puppet community, I’ll definitely make use of ask.puppetlabs.com and puppet-users. Oh yes, and thanks for the post-camp drinks, T-Shirt and Hat! I look forward to Puppet Camp London 2014! This entry was posted in Linux and tagged Linux on 28 March, 2013 by unixsysadmin.